What is the Council of Governments (COG)? What Does the Cape Fear Council of Governments Do? Where Does the Cape Fear Council of Governments Get Their Money? What Are the Most Pressing Regional Issues Today? How Does All This Affect Me, and Why Should I Care? Well-informed local government officials make more effective leaders! 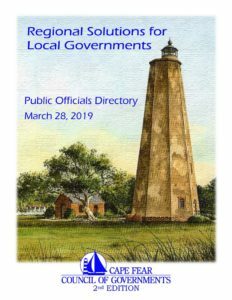 The Cape Fear Council of Governments is composed of the 44 municipal and county governments in Brunswick, Columbus, New Hanover, and Pender Counties, hereinafter referred to as “Local Governments.” Each Local government is eligible to join the CFCOG. Membership requires payment of annual dues assessed per capita. Each member government must appoint an elected member of their governing board to be their CFCOG Liaison who shall represent them at the Annual Membership meeting to vote on their behalf regarding election of the Executive Committee, and any other matters brought before the membership at that meeting. Their attendance at the six Executive Board meetings is optional, but their attendance at the annual membership meeting is required for their representation of their respective local government.Each CFCOG Liaison will be the primary point of contact for CFCOG matters throughout the year.